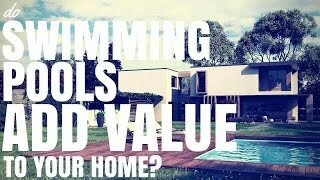 Yesterday I tackled the question about whether or not you should purchase an investment property with a swimming pool but today I want to talk about whether or not swimming pools add value to your home. The general consensus is no, they don’t add value and I’m going to go in to a bit more detail as to why that’s the case. 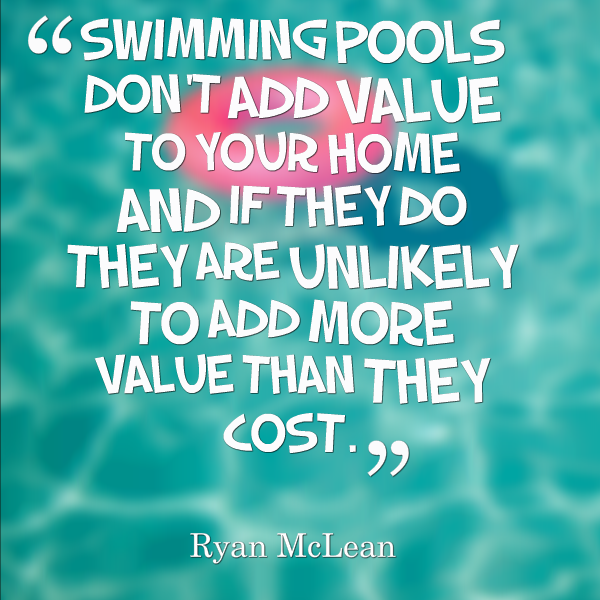 So the general consensus is that NO, swimming pools don’t add value to your home and if they do they are unlikely to add more value than they cost. If you go to a swimming pool website and you ask them this question then obviously they’re going to say “yes of course swimming pool can add a great deal of value” because they want you to go ahead and buy a swimming pool. When it comes to the property market that’s not necessarily the case. The reasons are that pools appeal to some buyers but they turn away many buyers as well. Now depending on your area they may attract a lot of buyers or they may attract very few buyers. I said in the last episode I’ll say it again, if you’re purchasing a property somewhere like Tasmania where is extremely cold, cold winters and not hot summers then having a pool is not going to be a huge attraction to many people. But if you’re purchasing a property somewhere like Cairns or Townsville or somewhere up on North Queensland or Darwin – somewhere where it gets really hot, well then a pool might be something that’s a necessity to that market. You need to assess your specific market and whether pool actually acts as an attraction to people or whether actually turns people away. I find the best way to gather this information is to speak to your local real estate agent and to ask them. They have a wealth of knowledge on the market because all they do is sell properties to the market that you are in. So if you talk to local real estate agent you can ask them about whether all those people are looking for pools, whether that turns people away, you can ask them about whether they believe it’s going to increase the value of the home or not. 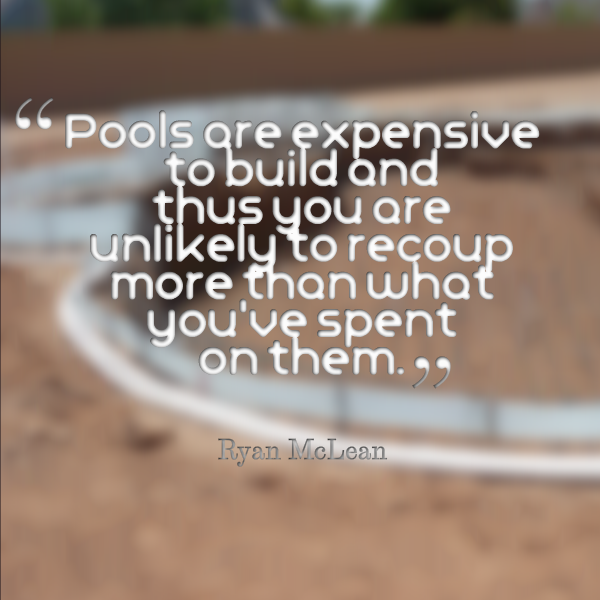 Pools are expensive to build and thus unlikely to recoup more than what you’ve spent on them. So because they’re expensive buyers are not necessarily going to go in and say “Well I believe the pool is worth $50,000”. The buyer is not necessarily going in and saying “okay well this pool is worth X amount of dollars and I’m willing to pay more than that”. Does that make sense? When they’re comparing your property with pool to a similar property without a pool they’re not necessarily going to say “well that pool looks like it costs forty grand so I’m going to add $40,000 to the value of that home”. That’s not necessarily how buyers think, they are just thinking what they want, they are thinking of their needs and the market that they are in and they want the best value for their money. Pools can actually reduce the value in some cases. When you got people who don’t want a pool and all the hassle that goes with it buyers may just see it as an expense and hassle. They might actually be turned away from the pool and they might actually not make offers on your property because it has a pool. A lot of real estate agent say “One of the best ways to get great deal for your house is to appeal to the most amount of people and to hope for a bidding war”. By adding a pool you’re probably appealing to less people and therefore a chance of the bidding war happening, pushing the price of your property up, is less likely. Sometimes a pool can actually reduce value because you’re appealing to a smaller market of people who want a swimming pool. So the general consensus is that if you want a pool in your property do it for personal reasons not financial reasons. You want a pool because you’ve got young kids and you want to go swimming and you live up on the Gold Coast like I do; a pool is important to me so if I’m going to install a pool I’m going to do it for personal reasons not for financial reasons. So there you have ‘do swimming pools add value to your home’? As I said the general consensus is no, not really but obviously every situation is different, every suburb is different so get advice from your local real estate agent as to whether or not it’s going to work for you .